Drugs called atypical antipsychotics caused kids to gain an average of 10 to 19 pounds in the first few months. (Health.com) -- Schizophrenia drugs, increasingly prescribed to children with bipolar disorder and other conditions, can cause youngsters to experience rapid weight gain, according to a new study. Dr. Christoph U. Correll, of Albert Einstein College of Medicine, in the Bronx, New York, and his colleagues found that children and adolescents who take the drugs, known as atypical antipsychotics, gain an average of 10 to 19 pounds in the first few months, depending on which drug they are prescribed. "That's a lot of weight to acquire very rapidly," notes Dr. Christopher K. Varley, of Seattle Children's Hospital, who wasn't involved in the study but co-wrote an accompanying editorial. Use of atypical antipsychotics in children has increased fivefold since the early 1990s. Prescriptions for one drug, risperidone (Risperdal), were up 10 percent in 2007. That year, 389,000 children and teens nationwide were prescribed the drug, and 240,000 of those were 12 or younger, according to information presented to a U.S. Food and Drug Administration (FDA) panel in 2008. Families already under the stress of coping with a young one's mental illness may have a particularly hard time helping their child maintain a healthy weight, says Varley. According to Varley and his co-editorialist, Dr. Jon McClellan, of the University of Washington, in Seattle, "these results challenge the widespread use of atypical antipsychotic medications in youth." 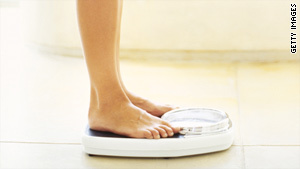 Experts have long known that atypical antipsychotics can cause patients to gain weight. But Correll's report is the first, and one of the largest, to investigate how these drugs affect children who haven't used the medications previously. Children who took olanzapine (Zyprexa) gained the most weight in the first 11 weeks, an average of 18.7 pounds, and also had higher total cholesterol and triglyceride levels. Those taking quetiapine (Seroquel) gained 13.4 pounds and also had a rise in total cholesterol and triglycerides. Risperidone didn't seem to affect cholesterol levels but was associated with higher triglyceride levels, and patients gained an average of 11.7 pounds. At 9.7 pounds, weight gain was lowest with aripiprazole (Abilify). Overall, half of the children gained more than 7 percent of their original body weight. Children in the control group gained less than half a pound. At present, the FDA has approved only two drugs, risperidone and aripiprazole, for use in children; both are approved to treat schizophrenia and bipolar disorder, and risperidone is also approved for "irritability associated with autistic disorder." In their editorial, Varley and McClellan point out that a lot of the research used to back up the use of atypical antipsychotics in children has been done in adults, and the makers of the drugs have funded much of it. The study by Correll and his colleagues wasn't funded by the pharmaceutical industry, but he and his coauthors report consulting for many drug companies, including the makers of the drugs they looked at in the current study--AstraZeneca (Seroquel), Bristol-Myers Squibb (Abilify), Eli Lilly (Zyprexa), and Ortho-McNeil-Janssen (Risperdal). Varley argues that there's been a "broadening" of the use of atypical antipsychotics in children. For example, they are sometimes added on to other medications, or used to treat children with impulse control problems or oppositional behavior who could probably benefit from therapy or behavior management strategies. Doctors who decide to prescribe these medications, he adds, must be "darn sure" their patients need them, especially since patients may be on the medication for months or even years, resulting in major weight gain that could quickly lead to obesity and the health problems that accompany it. Correll says that atypical antipsychotics are sometimes the only thing that can help autistic children with severe aggression, and that the medications are also very helpful for bipolar children with severe mania who aren't helped by mood-stabilizing drugs like lithium. Although Correll agrees that their use is controversial -- especially for treating autistic children's aggressive behavior and outbursts, based on the idea that therapy and other approaches should be tried first -- he argues that therapy sometimes isn't possible for these children until they are medicated. Correll could not say whether these medications might be overprescribed. "Numbers alone cannot tell you whether the use is appropriate or inappropriate," he says. "These determinations can only be made on a case-by-case basis." What the findings make clear, he adds, is that families need to be informed of the risk of weight gain, and that children should be prescribed the lowest-risk atypical antipsychotics first. "These medications are not created equal when it comes to side effects," Correll says. He suggests that doctors monitor patients closely for weight gain, and work with their families to help them "really focus on a healthy lifestyle" before the child has gained weight.